If you’re like me – highly allergic to poison ivy/oak, you may cringe at the thought of being exposed to it. As a result of much misery suffered from reactions to urushiol – the oil in the plant which causes the allergic reaction – I’ve tended to steer clear of anything that slightly resembles poison oak/ivy. 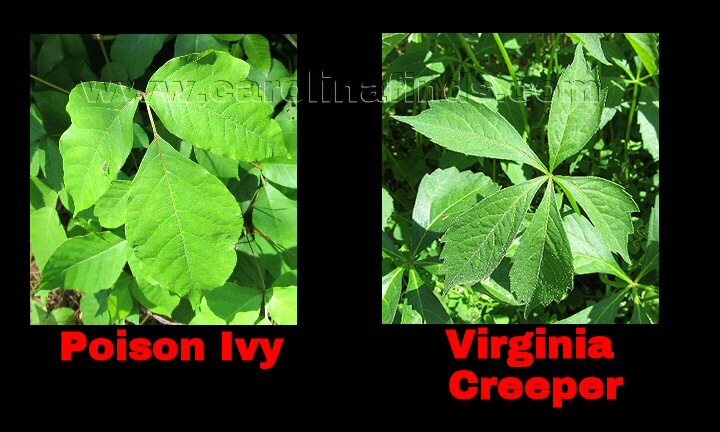 First of all, poison oak and ivy has THREE leaves. 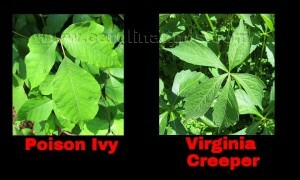 Virginia creeper has five. The coloration is so close, however, that it is easy to confuse the two plants. I’ve seen both growing together in my yard so look closely. Will I be using the brush trimmer there? Um, no. As much as I hate weed killers, weed killer it is. Poison oak/ivy has a nasty relative called poison sumac. Fortunately it’s not as common as it’s relatives – poison sumac prefers wetlands. Unlike ivy and oak, poison sumac has seven to nine leaves per stem. you handle clothing or shoes of someone who has been through it and has the urushiol on them, you come into contact. It’s a year round thing. Even “dead” vines can give you the itches. Urushiol can remain active for years! CAUTION. Do not burn poison oak or ivy. Urushiol carries in the smoke, and yes, there have been cases of people inhaling it as well. If you know you’ve been exposed, wash well as soon as possible. My guess is it’s best to shower, not take a tub bath – urushiol is an oil, it may float and expose even more of your skin. Use lots of soap but use cool or tepid water to avoid opening your pores. can’t say it worked miracles but I’d say it worked as well for me as calamine lotion. The next time I plan to add a few drops of oregano oil to the paste and give that a try. i can remember my mama putting Calamine lotion all over me since i was a small child. I looked like a bottle of pepto bismol but it worked. I was still miserable and to this day if i get a bad case of it i have to see good ole doc and get a steroid shot to stop the lovely rash. i told my doctor that my dog can go and walk thru it and there you go. Lucky me. i have seen some very nasty looking rashes on the internet. I feel so bad for those people. all i can say is don’t delay the treatment because it WILL NOT clear itself up on its own.